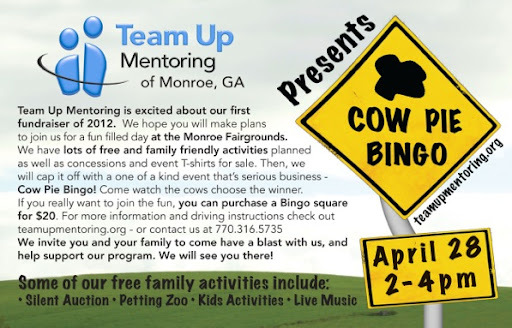 This Saturday afternoon, April 28th, make plans to head out to the Monroe Fairgrounds for Team Up Mentoring’s “Cow Pie Bingo” fund raiser. They have the schedule packed with lots of free and fun activities for your family to enjoy, followed by a very unique game of Bingo. I have only heard of this game recently, but have never seen it in action, I can’t wait to see what happens! Once again I have had the great opportunity to work with Team Up Mentoring for this event. One thing we wanted to do was create a fun cow T-shirt to make this unique experience even more memorable for everyone. This is what we came up with. Stop by and get one, they are only $12. 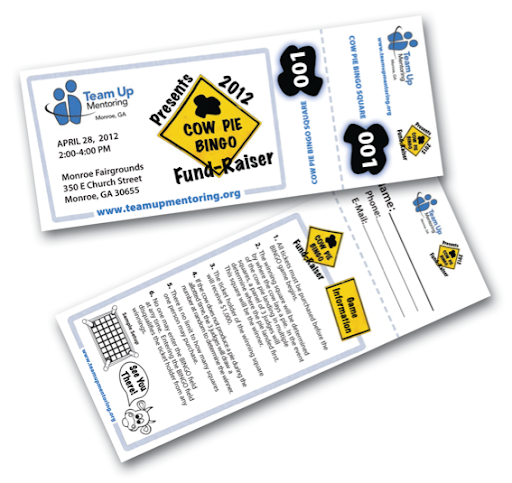 Also, we needed tickets to sell for the Cow Pie Bingo Event. I looked at ordering the typical ticket, but was very disappointed with the creative limitations. I then looked at the possibilities of creating our own tickets’s and I’m glad I did. We were able to come up with a stubbed ticket that is a lot more functional and fun. This is what the ticket’s look like. Complete with numbered Cow Patty Bingo numbers, haha! It looks like the folks at Team Up Mentoring have really set up a great event and Saturday is sure to be lots of fun. 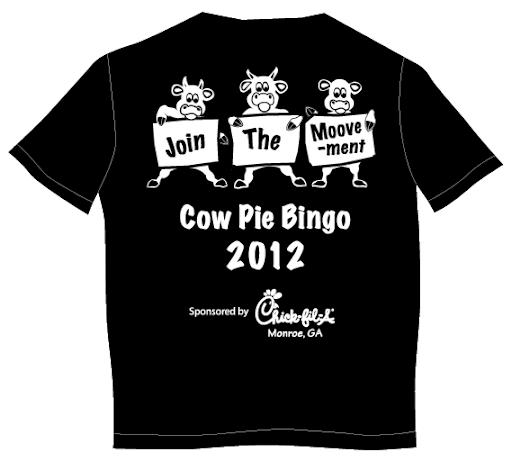 I’m really looking forward to seeing how Cow Pie Bingo works out! If you live in or around Monroe you should come by and check it out. There will be lots of stuff for the kids: facepainting, petting zoo, etc. as well as a Silent Auction and Cow Pie Event. There will also be concessions (Chickfila Sandwiches, drinks, snacks) and Tshirts available. You can also purchase tickets for the Cow Pie Bingo game if they are still available. The greatest part about this event is that it will help raise funds for Team Up Mentoring’s programs this year. If you don’t know that much about this group and the great things that are going, on I would encourage you to check them out. They are really making a difference in the community of Monroe. Director Anna Blount and her team have dedicated themselves to helping these kids in every facet of their lives. It’s exciting to see! Having been able to join the Team Up group on a few activities in the past it is easy to see the Lord’s blessing on this ministry. And to everyone who is participating in Cow Pie Bingo on Saturday, I hope you have a stinkin’ good time! HaHa!